Death*: Sarah Agnes Chisholm died on 25 June 2006 at age 80; MacFARLANE, Sarah Agnes - 80, formerly of Plymouth, Pictou Co., passed away on Sunday, June 25, 2006, in Colchester Regional Hospital, Truro. Born in Heatherton, she was a daughter of the late John Alexander (Jack Dan) and Mary Anne (Chisholm) Chisholm. Sarah was a long-time resident of Plymouth. She was a member of St. Gregory's Roman Catholic Church and the C.W.L., and a member of the Golden Glen Seniors of Plymouth. Sarah worked as a clerk for Robertson's Drugs then moved to Montreal where she resided for five years. She finished her working years at the Riverview Adult Residential Centre, Riverton. Surviving are daughter, Shelley (Mrs. Mitchell Mombourquette), Halifax; son, Paul and wife Marilyn, Durham; grandsons, Cameron and Rory, and granddaughter, Joei; sisters, Mary B. (Mrs. Bud Gilbert), Massachusetts; Theresa (Mrs. Lauchie MacDonald), Heatherton; brothers, Eugene, Antigonish; Colin (Mary), Halifax; Lauchie (Mae), Heatherton; Pat (Joan), Ontario; a number of nieces and nephews. She was predeceased by her husband, Angus Cameron MacFarlane; sisters, Helen, Betty, and Bernie; brothers, Donald and Ernie; son-in-law, Tim Meisner. Her remains will rest in H.W. Angus Funeral Home, New Glasgow, with visiting from 2-4 and 7-9 p.m. on Tuesday. Funeral mass will be held at 10 a.m. on Wednesday in St. Gregory's Roman Catholic Church with Father Robert Day officiating. Burial will be in Our Lady of Lourdes Cemetery. Donations in memory of Sarah may be made to St. Gregory's Roman Catholic Church. The family would like to thank the girls at Townsview Estates and the nurses of the 4th floor of Colchester Regional Hospital for the care their mother received. MacFARLANE, Sarah Agnes - 80, formerly of Plymouth, Pictou Co., passed away on Sunday, June 25, 2006, in Colchester Regional Hospital, Truro. Born in Heatherton, she was a daughter of the late John Alexander (Jack Dan) and Mary Anne (Chisholm) Chisholm. Sarah was a long-time resident of Plymouth. She was a member of St. Gregory's Roman Catholic Church and the C.W.L., and a member of the Golden Glen Seniors of Plymouth. Sarah worked as a clerk for Robertson's Drugs then moved to Montreal where she resided for five years. She finished her working years at the Riverview Adult Residential Centre, Riverton. Surviving are daughter, Shelley (Mrs. Mitchell Mombourquette), Halifax; son, Paul and wife Marilyn, Durham; grandsons, Cameron and Rory, and granddaughter, Joei; sisters, Mary B. (Mrs. Bud Gilbert), Massachusetts; Theresa (Mrs. Lauchie MacDonald), Heatherton; brothers, Eugene, Antigonish; Colin (Mary), Halifax; Lauchie (Mae), Heatherton; Pat (Joan), Ontario; a number of nieces and nephews. She was predeceased by her husband, Angus Cameron MacFarlane; sisters, Helen, Betty, and Bernie; brothers, Donald and Ernie; son-in-law, Tim Meisner. Her remains will rest in H.W. Angus Funeral Home, New Glasgow, with visiting from 2-4 and 7-9 p.m. on Tuesday. Funeral mass will be held at 10 a.m. on Wednesday in St. Gregory's Roman Catholic Church with Father Robert Day officiating. [S861] Ancestry.com, online www.ancestry.com, https://search.ancestry.com/cgi-bin/sse.dll,%20canada&msbpn=5005&msdpn__ftp=nova%20scotia,%20canada&msdpn=5005≠w=1&rank=1&redir=false&gss=angs-c&successSource=Search&_phtarg=tVE1367,tVE1373,tVE2996&pcat=BMD_DEATH&h=149197288&dbid=60527&indiv=1&ml_rpos=22. [S429] Obituaries from The Halifax Chronicle Herald Newspaper, Obituary of Sarah Agnes MacFarlane, June 26, 2006. [S102] Katrina Regan, "Regan, Katrina # 2558, Family Group Sheet." Death*: Cornelius died circa 1960. Name Variation: John MacDonell 2nd of Croulin was also known as Spanish John. Death*: John died in 1820. Canada, in 1820, drew up an account of his stirring early life, which appeared, with notes, in the " Canadian Magazine," April and May, 1825, by which it was shown that his father, John Crowlin, was educated at the Scots College, Rome ; that he himself was sent there to be educated as a priest in 1740, when twelve years of age. He disliked the proposed mode of life, and took to that of arms. He was in several battles, and was desperately wounded and left for dead before he attained the age of sixteen. He had more than once seen King James, and, in his eighteenth year, was entrusted by Cardinal York with a mission to Scotland and a large sum for Prince Charles, sailing from Dunkirk the very day Culloden was fought. How he was robbed of a thousand pounds by Colin Dearg, uncle to Dundonald, and other two gentlemen (!) of the name of Mackenzie, all three Jacobite officers ; his description of the infamous doings of the notorious Allan Macdonald of Knock, are graphically given, and the whole paper, kindly lent me by Mr Macdonell of Morar, is of surpassing interest. Eneas married Catherine, sixth child of Sir Norman Macleod of Bemera, she being at the time widow of Alexander Macleod, 7th of Raasay, and by her had a son Donald, whom I style 4th of Scotos, though he predeceased his father. Donald, 4th of Scotos, married, first, Ellen Meldrum of Meldrum, who left an only (laughter, Margaret, married to Prince Charles' devoted follower, Alexander Macdonald, younger of Glenalladale. Donald married, second, Elizabeth Gumming, by whom he had one son, Ranald, and a daughter, Florence. Florence emigrated to America, and married there Ranald Macdonald, of the district of Cornwall, in the province of Upper Canada. They were both living in 1785, but died by 1803, leaving two daughters. Donald married as his third wife Mary Cameron, of the family of Glen-Nevis, and, according to Mr Mackenzie, in his " History of the Macdonalds," had by her a son Archibald, a priest, but as to this I refer later on. "At the early age of 12 he was sent, in 1740, to Scots College, Rome, to be educated for the priesthood. After being three years at this college, he gave up the idea of becoming a priest, and resolved to become a soldier instead. A Spanish army was at that time in Italy, and he decided to join the Irish Brigade, under General Macdonald (of the Macdonalds of Antrim), who was second in command of the army. he afterwards saw a good deal of service, and suffered many hardships, being dangerously wounded in one of the battles. Hearing of the success of Prince Charles in Scotland, he and others of the Irish Brigade left Dunkirk in April, 1746, to join his standard. They landed at Lochbroom, and were informed of the defeat of the Prince at Culloden. Spanish John had been entrusted by the Duke of York with letters and a sum of 3000 pounds for Prince Charles. In an attempt to carry out the Duke's instructions he had many adventures, and was finally made prisoner by Captain Ferguson, who took him for Archibald of Barisdale, who was wanted. He was detained at Fort William for nine month, and was released for want of evidence against him. He afterwards settled at Knoydart, and had a tack of Inverguseran from Glengarry. He imigrated to Canada in 1775." Biography*: When his father succeeded to Glengarry, Angus, as eldest son, succeded to Scotus. He is represented as being a retired, quiet man, unfit to lead the Clan, and there is a tradition that Lord MacDonald made choice of Angus's brother, Alasdair Dubh to succeed him with the consent of all parties. Alexander undoubtedly led the Clan in the lifetime of his father, though Angus, not Alexander, was the eldest son. "Eneas, third of Scotos. As I am writing about the Scotos family, it must be here mentioned that, though now of no consequence as regards the headship, there is a tradition in the family that Eneas was really the eldest son of Ranald : that Lord Macdonell on his deathbed sent for Alastair Dubh, and invested him with the chiefship, as the more able man, and the one most likely to uphold the credit of the Clan, the eldest son Eneas being content to succeed his father in Scotos merely. Alastair Dubh certainly was one of the most famous of the race of Glengarry. going as far back as Donald Macangus, Alastair Dubh is not described as eldest son of Ranald. The late Colonel Macdonell of Glengarry, in the tree drawn up of the family, while giving prominence to the Barisdale, Lochgarry, and other branches, treats Scotos his admittedly nearest cadet very scantily, and in this he must have had some object. Other observations might be made ; but, as I have said, the matter has lost any interest it might at one time have had. Eneas, third of Scotos, seems to have possessed many lands which did not go to the eldest son's successors, and it is said he had the whole of Knoydart facing Loch Nevis, except Inveriemore, which belonged to Barisdale. after the American Revolution in Montreal, whose son Angus was father of the present Mrs Chisholm of Chisholm. Spanish John, born in 1728, who died at Cornwall, Upper Canada, in 1820, drew up an account of his stirring early life, which appeared, with notes, in the " Canadian Magazine," April and May, 1825, by which it was shown that his father, John Crowlin, was educated at the Scots College, Rome ; that he himself was sent there to be educated as a priest in 1740, when twelve years of age. He disliked the proposed mode of life, and took to that of arms. He was in several battles, and was desperately wounded and left for dead before he attained the age of sixteen. He had more than once seen King James, and, in his eighteenth year, was entrusted by Cardinal York with a mission to Scotland and a large sum for Prince ( 'harles, sailing from Dunkirk the very day Culloden was fought. How he was robbed of a thousand pounds by Colin Dearg, uncle to Dundonald, and other two gentlemen (!) of the name of Mackenzie, all three Jacobite officers ; his description of the infamous doings of the notorious Allan Macdonald of Knock, are graphically given, and the whole paper, kindly lent me by Mr Macdonell of Morar, is of surpassing interest. Death*: Ranald died in 1705 in Scotland. Biography*: Ranald succeeded, in 1680, his cousin, Angus, Lord MacDonald, in the Estate and Chiefship of Glengarry. Name-Comm: His common name was Donald Gorm. Residence*: Donald MacDonell 1st of Scotus lived in 1650 in Scotus, Scotland; MINOR HIGHLAND FAMILIES No. III. comprehending Penvoit, Penvoir, and the one penny land of Dornach ; half penny land of Torbruiach ; and half penny land of Corryleatach, all lying in Killichniman of Glenelg. These lands were held in feu of Glengarry for the sum of 3 Os 6d, being apparently the exact one paid by Glengarry for the whole of Knoydart to the Duke of Argyle, over superior.
" All and Whole, the Lands and Estate of Scothouse, which all connect, and extend fifteen miles in length, and in breadth variable- from four to five miles.
" This property has been occupied as a sheep store farm now for six years bygone, is known to have produced as good wedders as any from the Highlands, which is well known in the Glasgow markets.
" In 1788 upwards of 1000 wedders, not lambed upon the property, fetched 17s 6d each. The store is not at any time affected by braxy, trumbling, sturdy, or any other disease of that kind, and the fox is totally extirpated. There are high mountains on the property, which are green and produce natural clover to the top.
" The Lands will at least graze 6000 sheep, besides the ordinary milk cows to the shepherds and a few for the tacksman. They lie contiguous to market, being only 20 miles from the military road leading by Fort William to Glasgow, and are situated along the well-known sea-lake, called Loch-nevis, at the south, which is one of the best anchorage lochs for shipping in Britain ; abounds with herring and muddfish, and from the frequency of busses and vessells which frequent that loch and pass the inner Sound, there is a great demand for cast sheep. The lands lye within a mile of the other well-known lake called Lochhourn, at the north, which also abounds with herring and muddfish. There is upon the property, and will be Lett with the Lands, a substantial good Mansion House, with office houses and garden." The mansion-house is described in the year 1800 "A double house, thoroughly finished, of two storeys high, with office houses, and a garden equal for vegetables to any to the north of Edinburgh." There was some fine furniture, old china, &c., remaining in the house in 1806, years after the property was sold. A galley for the family use, which made journeys to the West Coast and the Hebrides, swung at anchor in the bay of Scotos. Death*: Donald died before 1682 in Scotland. Biography*: The lands of Scotus consisted originally of 12 1/2 penny lands, being part of the 60 penny lands of Knoydart. Donald M'Angus bestowed these lands of Scotus by feu charter upon his son, Donald Gorm. "The particular description ran thus: - The four penny and half penny lands of Scotos; ane pennyland of Torroray; one penny and one half penny land of Inverie-beg; one penny land of Shennachie; one penny land of Angrugaig and Teaflich; two penny and one half penny land of Glendulochan, comprehending Penvoit; Penvoir, and the one penny land of Dornach; half penny land of Torbruiach; and half penny land of Corrleatach, all lying in Killichniman of Glenelg. These lands were held in feu of Glengarry for the sum of £3 0s 6d, being apparently the exact one paid by Glengarry for the whole of Knoydart to the Duke of Argyle, over superior. [S219] Ronald Williams, The Heather and the Gale. Angus Macalister Macdonald, 7th of Glengarry was the son of Alexander Macdonald, 6th of Glengarry and Margaret Macdonald. He married Janet MacLean, daughter of Hector Maclean, 8th of Duart. He married Margaret MacLeod, daughter of MacLeod of MacLeod. He married Mary Mackenzie, daughter of Kenneth Mackenzie 5th of Kintail. He died in 1574. [S506] Robert Joseph Gillis, Two Gillis Families, page 29. [S506] Robert Joseph Gillis, Two Gillis Families, page 29, 31. [S923] F. S. A., Scot. Alexander MacKenzie, History of the MacDonalds and Lords of the Isles, page 300. Biography*: Married his cousin, a daughter of Cameron of Lochiel, whose mother was a daughter of Hector ‘’Mor’’ MacLean of Duart. John the 5th chief of Glengarry was killed by Fraser of Lovat after being invited to a meeting with him. [S861] Ancestry.com, online www.ancestry.com, 0861 - 2573 - Alexander of the Woods. Biography*: Second son of Ranald of the Isles (his elder brother Allan succeeded as chief of Clan Ranald). Donald first married a daughter of the chief of Clan MacIver from which his first son John and secondly married a daughter of Lord Fraser of Lovat from which his second son, Alexander of the Woods. [S577] Norman H. MacDonald, The Clan Ranald of Knoydart & Glengarry, page 20. Name Variation: Ranald MacDonald 1st of Clanranald was also known as Ranald of the Isles. Biography*: Ranald was called High Steward of the Isles. He was the ancestor of Clan Ranald. Ranald MacDonald was the eponymous ancestor of the MacDonalds of Clanranald. He was a son of John MacDonald, Lord of the Isles (d. 1386), and his first wife Amie MacRory. John granted Ranald the lands of Garmoran, which he had acquired through his marriage to Amie. This grant may have been a form of compensation for Ranald's exclusion from the main inheritance of the family, which fell to Donald, the eldest son of John's second marriage. The Uists were later detached from Garmoran and given to Ranald's younger brother, Godfrey. Ranald died at Tioram Castle in 1386, and was buried on Iona. A cross-shaft found on Texa bears the following Latin inscription: HEC EST CRUX REGNALDI JOHIS DE ISLA ("this is the cross of Ranald [son of] John of Islay"). The shaft depicts a Hebridean warrior armed with an axe, which may well be the earliest surviving depiction of a MacDonald. From Ranald descend the MacDonalds of Clanranald, and the MacDonells of Glengarry. The Macdonalds of Clanranald are one of the branch clans of Clan Donald—one of the largest Scottish clans. The eponymous ancestor of Clan Donald is Donald, son of Reginald, son of Somerled. Somerled, son of Gillebride was 12th century leader, styled as "king of the isles" and "king of Argyll", though his origins and ancestry are obscure. The Macdonalds of Clanranald descend from Donald's son, Angus Mor and then from his son, Angus Og. Angus Og's son John was the first Lord of the Isles. John's first marriage was to Amie mac Ruari, heiress of Clan Ruaidhri (which was founded by Ruaidhri, elder brother to Donald, founder of Clan Donald). John later divorced Amie and married Margaret, daughter of Robert II. The children from John's first marriage were passed over in the main succession and the chiefship of Clan Donald and the later Macdonald Lords of the Isles would go on to descend from John's second marriage. The Macdonalds of Clanranald and MacDonells of Glengarry both descend from John and Amie's eldest son, Reginald. he era from Reginald down to his great-grandson Allan, son of Roderick, is by far the most obscure in the history of the clan. From the years 1372–1495, no charters of the family exist and it is impossible to know for certain exactly what territories it possessed. The earliest document to shed some light on this era is a charter granted by James V to John Moidartach in 1531. It states that the lands granted had been held by his grandfather, Allan, son of Roderick, and his predecessors. The lands mentioned were the 27 merklands of Moidart, the 30 merklands of Arisaig, 21 merklands in Eigg, and the 30 merklands of Skirhough, in South Uist. According to Angus and Archibald Macdonald, it seems likely that this mere fragment of Ranald's original lands was all that the senior branch of Reginald's descendants had left by the time of Allan, 2nd of Clanranald. Biography*: John of Islay (or John MacDonald) (Scottish Gaelic: Eòin Mac Dòmhnuill or Iain mac Aonghais Mac Dhòmhnuill) (died 1386) was the Lord of the Isles (1336–1386) and chief of Clan Donald. In 1336, he styled himself Dominus Insularum, "Lord of the Isles"; because this is the first ever recorded instance of the title in use, modern historians count John as the first of the later medieval Lords of the Isles, although this rather broad Latin style corresponds roughly with the older Gaelic title Rí Innse Gall ("King of the Isles"), in use since the Viking Age, and for instance, the even more similar Latin title dominus de Inchegal ("Lord of the Hebrides"), applied to Raghnall Mac Somhairle in the mid-12th century. In fact John is actually styled Rí Innsi Gall or King of the Isles shortly after his death in a contemporary entry in the Irish Annals of Ulster. John was the son of Aonghas Óg, an Islay-based nobleman who had benefited from king Robert I of Scotland's attacks on the MacDougall (Mac Dhùghaill) rulers of Argyll and their Comyn allies, and had been given Ardnamurchan, Lochaber, Duror and Glencoe, turning the MacDonalds from the Hebridean "poor relations" into the most powerful kindred of the north-western seaboard. The loyalty of Aonghas to Robert, however, did not mean that John's loyalty to Robert's son and successor David II would follow suit. After Edward Balliol's coup against the Bruce regime in 1333, Edward attempted to court John. In 1336, Edward confirmed the territories which the Islay lords had acquired in the days of Robert I; and additionally, Edward awarded John the lands of Kintyre, Knapdale, Gigha, Colonsay, Mull, Skye, Lewis, and Morvern, held by magnates still loyal to the Bruces. John, however, never provided Edward with real assistance. Although Balliol's deposition by the supporters of David meant that the grants made to John void, John's pre-1336 possessions were in fact confirmed by King David in 1343. Moreover, in 1346, John inherited the great Lordship of Garmoran through his marriage to Amie mac Ruari after the death of her brother Raghnall Mac Ruairidh. This meant that John's dominions now included all of the Hebrides except Skye, and all of the western seaboard from Morvern to Loch Hourn. John continued to build his power based by allying himself with Robert II of Scotland, another west highland magnate who was the designated heir of King David. After David went into English custody in 1346, Robert acted as the de facto ruler of Scotland north of the river Forth. In 1350, John was given Robert's daughter Margaret Stewart in marriage, and received Knapdale and Kintyre as dowry. However, Robert was the senior partner, and John had to divorce his first wife Amie; his sons Godfrey, John and Ranald by Amie were to be passed over in the succession in favour of any children by the marriage with Margaret. After the capture of the king and death of John Randolph at the Battle of Neville's Cross in 1346, John and Robert worked together taking control of the huge earldom of Moray, bringing MacDonald power into Lochaber and Stewart power into Badenoch. David returned to Scotland in 1357, and resented these incursions into an earldom which David regarded as within his rights of disposal; the terms of the original grant of Moray to Thomas Randolph in 1312 stipulated that the earldom would revert to the crown upon lack of issue. By 1368, King David had decided that an aggressive policy was needed in the north. In 1369, he marched to Inverness, where John submitted to his authority. John's submission, though, was followed swiftly by David's death on February 22, 1371. David was succeeded by John's close ally Robert. David had wished either to retain control of the earldom or to grant the earldom to either John or George Dunbar, the sons of Isabella Randolph, sister of the last earl. However, King Robert made sure that Badenoch remained within his own control and that John kept Lochaber. When the earldom was granted to John Dunbar by a parliament held at Scone in early 1372, the grant consisted only of the lowland part around Inverness. Robert also ensured that John's control of the Mac Ruairidh inheritance was legally recognized by charter, and in 1376 issued charters confirming John's control of Colonsay, Kintrye and Knapdale, and granted Lochaber to John and his Stewart wife together. Soon after 1376, John's heir Domhnall may have been the de facto ruler. John lived until 1386, when he died at Ardtornish Castle in Morvern. He was buried in Iona. John's power had been built on both the loosening of royal authority in north-western Scotland after the First War of Scottish Independence and, more importantly, through allying with the right people at the right time. The success of John was so great that his successors could maintain a distance from the crown that outlived the weak monarchy of the 14th century. John was also a great cultural and religious patron. Although the Bishop of the Isles, based at Snizort on Skye, was outside his control and to some extent acted as a political rival, John did control Iona, the spiritual homeland of Scottish Christianity. The monastic establishment of Iona was run with John's approval by the MacKinnon (Mac Fhionnghuin) kindred. John also founded an Augustinian priory at Oronsay, an act unique in the period. John, married Ellen, daughter of Gillespic Campbell. Ranald, d. 1386, married a daughter of Walter Stewart, Earl of Atholl. Domhnall of Islay, Lord of the Isles, d. 1423, married Mary, daughter of Sir Walter Leslie. John Mór Tanister, d. 1427, married Marjorie Bisset, daughter of Sir Hugh Bisset. Alastair Carrach, d. c.1440, married Mary, daughter of Malcolm, Earl of Lennox. Mary, married Lachlan Maclean of Duart. [S746] Wikipedia, online http://Wikipedia.com, http://en.wikipedia.org/wiki/John_of_Islay,_Lord_of_the_Isles. Name-Comm: Her common name was Amie. Married Name: As of circa 1340,her married name was of Isla. Biography*: Aonghas Óg MacDomhnaill (Anglicised: Angus MacDonald the younger) was the son of Aonghas Mór MacDomhnaill. As Lord of Islay and chief of Clan Donald, he was a Hebridean nobleman who participated in the Wars of Scottish Independence. He was the son of Aonghas Mór MacDomhnaill and a daughter of Cailean Mór, and a grandson of Domhnall mac Raghnaill the eponymous founder of Clan Donald, who in turn was a grandson of Somerled. Prior to 1306, Aonghas was with his elder brother Alasdair Óg, then the Lord of Islay, by being partisan to the Baliol party, the elder brother being attached to that faction by virtue of his marriage to a daughter of Alexander of Argyll, chief of Clan MacDougall. When Robert the Bruce went on the run after the Battle of Methven, he eventually ended up in Kintyre following his defeat at the hands of John of Lorne in the Battle of Dalrigh. Aonghas the lord there, and an enemy of Argyll and Lorn, hospitably received the Bruce into his stronghold of Dunaverty Castle, in August 1306. For greater security Aonghas had Bruce transported to Rathlin Island, where Bruce was sheltered by Hugh Byset, lord of the island. Aonghas assisted in the 1307 attack upon Carrick, when the king had landed in his patrimonial district. When having established his power, King Robert granted Aonghas large fiefdoms: for example, both his elder brother's holdings, including the island of Islay, and much of the holdings of the MacDougalls. This was an important step in the rise of Clan Donald (a junior branch from king Somhairle mac Gillebride) at the expense of Clan MacDougall (who were the senior agnatic heirs of king Somhairle). 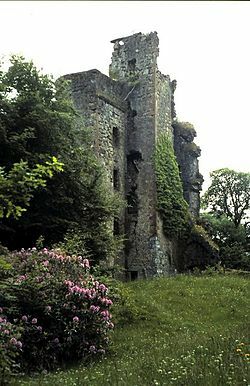 Alasdair Óg had to surrender to king Robert, and he was kept imprisoned in Dundonald Castle, Ayrshire, where he died in 1308. His whole possessions were forfeited and given to his younger brother, Aonghas. Aonghas fought, with a contingent of Isles warriors, at the Battle of Bannockburn in support of the Bruce. In recognition of Clan Donald's support King Robert proclaimed that Clan Donald would always occupy the honoured position on the right wing of the Scottish army. As territorial rewards, the king bestowed upon Aonghas the lordship of Lochaber (which had belonged to the Comyns), with the lands of Durrour and Glencoe, and the islands of Mull, Jura, Coll Tiree, etc., from the patrimony of the chiefs of MacDougall. Aonghas Óg died in 1330 at Finlaggan Castle on Islay and was buried on Iona. Fionnuala, married Uilleam III, Earl of Ross, papal dispensation to marry granted 8 June 1342. [S171] Nigel Tranter, Flowers of Chivalry. [S822] Walter MacFarlane of that Ilk MacFarlane's Genealogical Collections Vol. I, page 164. Biography*: The MacDonalds in "Clan Donald" give Angus Mor's mother as a daughter of Walter the Steward, possibly Donald's second wife, while Williams in "The Lords of the Isles" says she was a daughter of her father's uncle, Gilles mac Somerled. Aonghas Mór (Anglicized: "Angus the Elder" or "Great"), also known as Aonghas a Íle ("Angus of Islay") and Aonghas mac Domhnaill (Modern: Aonghas MacDhòmhnaill; Anglicized: "Angus MacDonald" or "Angus, Donald's son"), was the son of Domhnall mac Raghnaill, eponymous progenitor of Clan Donald. Aonghas Mór has been called "the first MacDonald" by one historian, namely because he was the first of the dynasty created by his father to rule Islay. Islay was the centre of the lordship of both Aonghas and his father; and according to a contemporary praise-poem, the realm Aonghas inherited from Domhnall included "every house from Mull to Kintyre" (gach teach ò Mhuile go Maoil). According to later Gaelic tradition, he was fostered by Dubh-Sidhe, alleged progenitor of the "MacDuffie" (now MacDhubhaich) kindred of Colonsay, undoubtedly a tradition that served to connect the two kindreds at the time it was developed. He appears granting a charter to Paisley Abbey which can be dated between 1241 and 1249. The first extant reference to Aonghas as "Lord of Islay" dates to 1256. In 1263, during the war between Haakon IV of Norway and Alexander III of Scotland, the Norwegians invaded Aonghas' territory and forced him to join them. Aonghas switched back to the Scottish side in the following year, sending his son Alexander Óg as a hostage to the king. Much of the remainer of his life is mysterious. He was one of the magnates who in 1284 recognised the right of Alexander III's granddaughter, Margaret, Maid of Norway, to succeed to the throne; he appears in documents as late as July 1292. He died on Islay in either 1294 or 1295, and was buried in Iona. Aonghas was the subject of notable praise-poem called Ceannaigh duain t'athar, a Aonghas ("Pay For Your Father's Poem, Aonghas"), written for him by an Irish poet soon after acceding to his father Domhnall's lordship. The poem is at face value a request that Aonghas fulfill his father's debt to the poet; it styles him, among other things, Aonghas Íle (Angus of Islay) and rí Leodhais ("King of Lewis"). "Aonghas of Islay, son of Domhnall"
[S923] F. S. A., Scot. Alexander MacKenzie, History of the MacDonalds and Lords of the Isles, page 37. [S217] Ronald Williams, The Lords of the Isles, pages 132-133. 0861 - 0354 - Joseph A MacFarlane.docx. [S923] F. S. A., Scot. Alexander MacKenzie, History of the MacDonalds and Lords of the Isles, page 39. [S923] F. S. A., Scot. Alexander MacKenzie, History of the MacDonalds and Lords of the Isles, page 35. [S923] F. S. A., Scot. Alexander MacKenzie, History of the MacDonalds and Lords of the Isles, page 36.